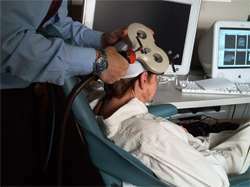 (PhysOrg.com) -- New research going on in Albequerque, NM by a team of neuroscientists working for the Defense Advanced Research Projects Agency (DARPA) indicates that mild brain stimulation with electrical shocks, might in fact cause people to learn more easily. The team, led by Vincent Clark, of the University of New Mexico, has been applying electrodes to the scalps of volunteers, and then giving them very mild electrical shocks while they play a battle simulation video game designed to teach soldiers to react properly in stressful conditions. Called transcranial direct-current stimulation (tDCS), the procedure employs a nine volt battery and electrodes connected to wet sponges affixed to the temples of game players to send just a few milliamps of current through the skull and into the brain as they attempt to differentiate between friend and foe in dilapidated, potentially dangerous environmental conditions. Two groups were tested, one received 2 milliamps while they played, the other just 0.1. The volunteers receiving the larger amount showed twice as much improvement as those that did not, which Clark says shows quite clearly how effective tDCS can be. Pilot video for tDCS informed consent. Applying electricity to the brain has a long and at times dark history. Doctors, psychiatrists and other researchers have known for hundreds of years that applying electrical current to the brain can cause changes; some good, some not so much. Electrical stimulation has been used to keep executed prisoners from twitching after death, to help patients overcome depression and more recently to help people with injuries or brain impairments to regain functionality. This history now colors any new research as fear and skepticism tend to get in the way of serious work. This is likely the reason that this new research is being done by DARPA, rather than an independent organization; it doesnt have to answer to anyone except the DoD. Because the amount of current is so small, volunteers report no pain, just a slight tingling sensation during the procedure, and afterwards can offer no real explanations as to why they performed better than they might have otherwise. This research, and other studies like it, have set off both alarms and intrigue in certain quarters. Some worry people, such as college students will jump on the procedure as a means to help cram for exams, others wonder if electronic devices such as blue-tooth phones are emitting electricity that might help them learn; while others yet point out, very soberly, that no one really knows just yet what long-term effects people might have from exposure to something as simple as tCDS. Paragraph three ought to be deleted--it adds no relevant information and sophomorically and irresponsibly imputes a sadistic intent to doctors who deliver electroconvulsive therapy. Does the author not realize that people actually die by the thousands because of mood disorders? Certainly he denies knowledge that electroconvulsive therapy is a safe and dramatically effective treatment for those illnesses. I have personally treated patients with ECT who spontaneously volunteered that it was a life-saver. But the dread with which you infuse paragraph three tries to frame ECT as a Frankenstein-redolent torture. Mr. Yirka, your writing promulgates the very fear you say gets in the way of "serious work". Fail--go back to journalism school. Nothing in paragraph three is untrue. I see no such denials that you claim. It adds some relevant history to the story. It sure seems you are reading more into what was actually in the text. Perhaps you'd rather these facts be forgotten so you don't have to deal with the stigma of what you do. ???? Before you claim my ignorance, know that my brother has paranoid schizophrenia and has had ECT treatment. I am in no way against it, I'm just confused as to why you are so defensive about what you do. Paragraph three ought to be deleted--it adds no relevant information and sophomorically and irresponsibly imputes a sadistic intent to doctors who deliver electroconvulsive therapy. Does the author not realize that people actually die by the thousands because of mood disorders? Certainly he denies knowledge that electroconvulsive therapy is a safe and dramatically effective treatment for those illnesses. I have personally treated patients with ECT who spontaneously volunteered that it was a life-saver. But the dread with which you infuse paragraph three tries to frame . Paragraph three is essentially and entirely inoffensive and well stated. Perhaps, you needed to vent, and after a stressful day and a long night with your 'patients' you saw a bit more in paragraph three than anyone else. Reread the article after Easter...that is, take the long weekend off, and read this again, say, Monday and let us hear from you on the rebound, please. I have to agree with chthonic. The information isn't necessarily incorrect, but it puts forth a tone that is very negative. Quotes around the word help suggest a sarcastic tone even though ECT can be an extremely effective treatment for depression. Also, the last sentence is just wrong. First of all, DARPA is a funding body. The research is done at a university. The researchers will be subject to all ethical standards put in place by DARPA (yes they have them), the university, and any journals the researchers wish to publish in. Also, most research is funded by NIH or NSF, "independent organizations". There is no reason to believe that this same research couldn't be funded by non DoD sources. This story is based on our research. I wanted to clear up one major misunderstanding in this article. The work was in fact performed at our University, with full approval and oversight by the University's IRB. As Cogsci says, it was not performed by the DOD, they just provided the funding.